From a distance, the forests of the Sierra Nevada look blotchy, with patches of dead trees standing right next to healthy green ones. Nate Stephenson, an ecologist with the U.S. Geological Survey, says the drought and high heat combine to do things he hasn't seen before. "We don't really understand a lot of things," he says, "like exactly how a drought kills a tree, or what's going on underground. Where is the water flowing in areas we can't see?" Stephenson and his team of ecologists pull into a designated spot in the mountains, near Sequoia National Park, with truckloads of equipment they'll have to carry in. Their mission: to find out what separates the surviving trees from the dead. Their ultimate destination is down a steep slope — through a blanket of pine needles, rotting tree limbs and a few yellow-jacket nests they are careful not to walk on. The walk is worth it. Looming above is Odin, a green and thriving giant sequoia that's more than 1,600 years old. The top is 250 feet up. Its base is as wide as a city street. Odin was a sapling when Rome was still an empire and, for some reason, it and many other sequoias are resisting this drought. In hopes of finding clues to Odin's survival, Cameron Williams, a researcher with the University of California, Berkeley, is heading up to the top. "I consider myself a forest canopy biologist," Williams says as he buckles on a climbing harness festooned with clips, carabiners, and an ascender — a kind of a clamp attached to the rope he will use to climb up. He practices his emergency communication system: "Aaaaaaaaahhhhhhhhhhhhhhh," he yells, then laughs. Williams can joke because he's done this so many times. He and his climbing partner, Rikke Naesborg, also a research scientist at UC Berkeley, have spent hundreds of hours up in this tree. They take meticulous measurements, limb by limb, as though studying a patient etherized on a table. "Every single branch," says Naesborg. She takes notes dangling from the rope. "You get used to it," she says. They check the tree's growth rate, and how much moisture is in each branch and in the needles and cones. "It's very, very laborious," Williams says. 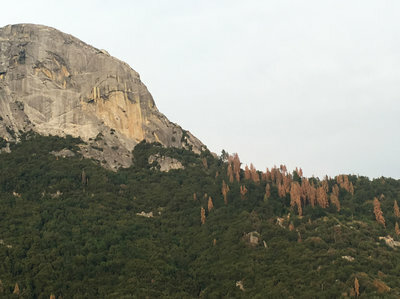 Todd Dawson, the plant ecologist from UC Berkeley who is in charge of the expedition, says what's happening to these forests is shocking and abnormal. "There are a lot more dead trees in this forest than I've ever seen since we've been working here — since 2008," Dawson says. Dawson is like an epidemiologist — studying disease in a large population. In this case, the patients are trees. There are far too many to be able to climb each one, so while some members of the team take Odin's measurements, Dawson is going to experiment with another approach. 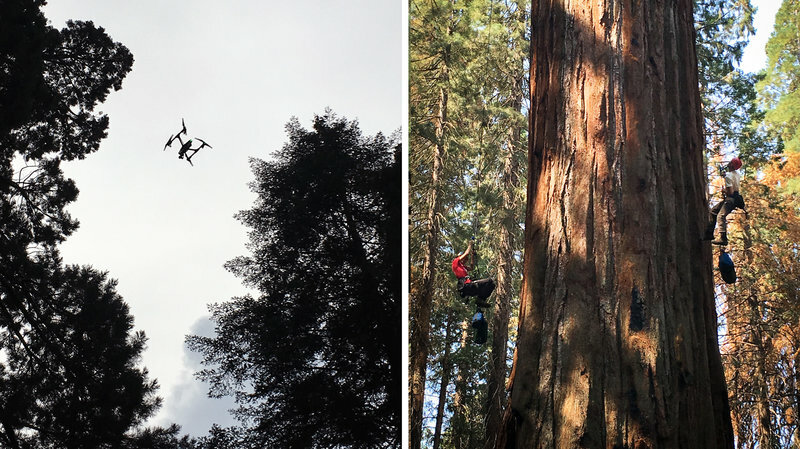 He'll fly a drone around the giant sequoia — carefully avoiding branches on every side — and take detailed images. "This is the first time for all of us," says drone jockey Tom Jennings, who works for a company called CloudD8TA. "So we're taking our time and trying to be very cautious. We're dealing with the canopy, and that's a new hazard that I'm not used to." The drones will fly to the top of the tree and then down around it in a spiral, taking many different sorts of images. What the team hopes to do is compare what the climbers see with what the drones reveal. If drones can diagnose a tree as well as a climber can, they could cover a whole forest much faster. The black drone rises from the ground, equipped with sophisticated cameras. It's about 3-feet square and looks like something Darth Vader would have on his desk. It records, basically, the reflected light off the canopy," Dawson explains. "And that reflected light give us the health of the crown itself — water content and other chemicals like chlorophyll content, which is related to photosynthesis and nitrogen content." These readings reflect how stressed the tree is. As the drone slowly descends from the top of Odin, Williams pulls himself up the tree, on a rope the size of his pinky finger. He narrates his climb into a microphone clipped to his shirt. "So we just reached 160ish feet above the ground," Williams says. "Looks like a long way down there, and I can hear a drone overhead. Sounds like a giant bee's nest. Looking around the landscape you can really see a lot of dead trees. Wow. There are hundreds — potentially thousands — of dead trees I can see in this one view." Already, from these sorts of measurements, Dawson has found that forests at low and mid-elevations — pine trees, fir, cedar — are suffering the most. Drought and heat can choke a tree to death, scientists have found, by causing gas bubbles to form in the trunk, and block the flow of water. The stressed trees also close their stomata — the pores they respire through in the leaves and needles. That conserves moisture, but at a high cost. They can't take in the carbon dioxide they need to survive. In other cases, beetles detect the weak trees and single them out — like predators taking wounded prey on the Serengeti. So how are giant sequoias like Odin different? 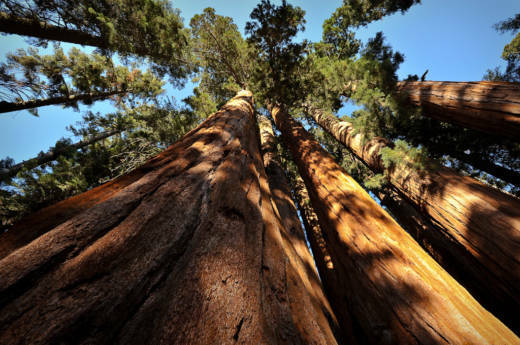 It could be that sequoias tend grow where there's more groundwater, Dawson says. Or maybe it's the way they shed needles when stressed. Understanding how different species of trees respond is already helping scientists focus their rescue efforts. For starters, you might thin the forest in places, removing some small trees and underbrush, Stephenson says. Having fewer straws sucking water out of the ground, means more water, more light and more nutrients for the biggest trees in the landscape, he says. And that would help the survivors weather future environmental stresses. California's current drought is disaster, but also a huge natural experiment, the forest ecologists say. Any lessons they can glean from studying Odin — going strong despite the drought — could help them save the rest of the forest.